Free real-time quotes have returned to Yahoo! Finance this week. Read more about it on the Yodel Anecdotal blog announcement. Yahoo!’s stock has been pretty flat since the Microsoft buy-out offer, but for stocks that move a lot during day trading, this should be pretty cool. I feel like a winner: “Congratulations!” it says. Now all I have to do is pay my taxes! 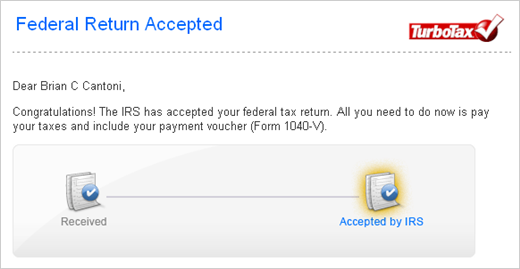 I guess at some level I should feel good that the IRS has accepted my creation. The cute icons are a nice touch but don’t go far enough. I’d use the Windows animated file copy dialog as a guide and show dollar signs floating from you to the IRS. … I am staring at more than 1,300 rebate requests sent to Vastech on Bonaventura Drive in San Jose. The envelopes were tossed – unopened – into a garbage dumpster near Vastech. I have two boxes of envelopes that were thrown out without being processed. In all of my years of reporting, I have never encountered such outrageous behavior against consumers. The proliferation of rebates clearly favors retailers and manufacturers, with consumers on the losing end. Rebate offers are very popular at Fry’s Electronics and, as Dean mentions in the article, they don’t want to be the only retailer to stop using them. My advice to friends shopping at Fry’s is to avoid the rebates entirely if they can and if not, limit it to name-brand companies. For Intuit’s customers, Tax Day turned out to be even more stressful than they’d feared – and the company faced quite a challenge, too. The Mountain View financial software company’s servers couldn’t cope with the massive Web traffic from last-minute electronic filers. 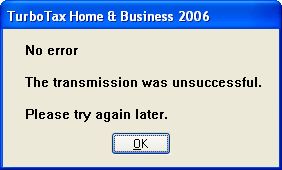 So when some Intuit TurboTax customers logged on to e-file their taxes, they saw error messages and weren’t able to file. Intuit blamed the problems on what was record site traffic leading up to Tuesday’s midnight tax deadline … Twice as many people e-filed with TurboTax Monday as during the comparable day last year, well beyond the company’s optimistic expectations. The marketplace has essentially trained a generation of taxpayers to wait until the last minute. For more on this, check out CNET News in which I learned that the IRS is giving TurboTax customers another 48 hours to submit their returns electronically. Amazing! Note to Self: Next year, please don’t be an idiot and wait until the last minute!